If this is your first time seeing Fig. 1, it is the Swim Smooth 3 keys to swim performance and it is the foundation of the Swim Smooth method of swim development. This simple pie chart depicts how to divide your training schedule giving each area of the chart equal training time (33.3% training/33.3% technique/33.3% open water). Admittedly, before Swim Smooth, my training looked more like Fig 2. As you can see I spent much of my time just training, which I viewed as absolutely necessary considering I was preparing for marathon swims such as the Swim Around Manhattan and the English Channel. I can’t help to think how I would have fared if I had had a more balanced approach. Would I have saved myself some unnecessary shoulder pain and soreness if I had swum with better posture after performing Kicking on the side drill? Would I have had better catch set up if I had paid more attention to the scull drill? Could I have recruited the right muscle groups for enhanced propulsion if I had done more doggie paddle? Are you frustrated because your swimming has hit a plateau? If so, I strongly suggest taking your technique training seriously by giving it the time it deserves. It might be what is holding your swimming back! I will be returning to Clermont, Florida for another 2-day Swim Smooth Camp, March 17th and 18th. 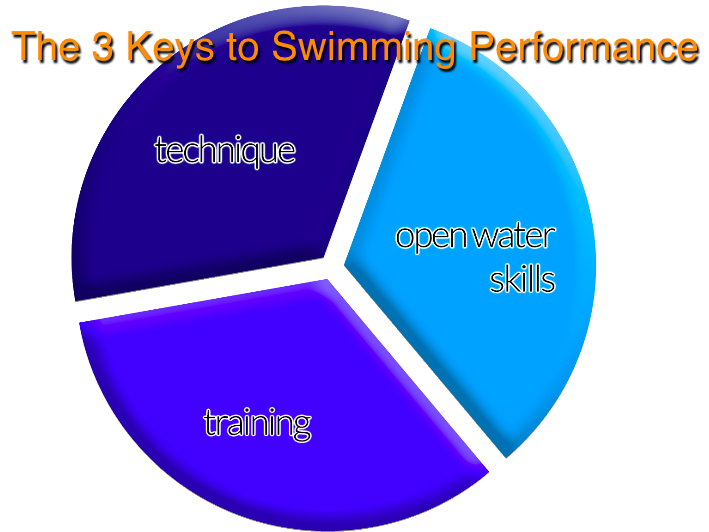 Development of critical open water skills to transfer your pool swimming ability across to the open water. Newer PostOpen Water training at the pool!